I'm going to a goth baby shower soon (well one parent is a goth, the other is some sort of rocker/gothabilly?) so I started looking around today for a cute baby shower gift that wouldn't just be boring black-black-black. 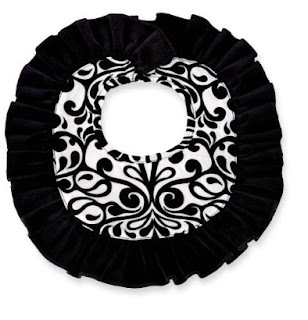 I decided to see if there were any cute damask things for baby girls, and I wasn't disappointed! 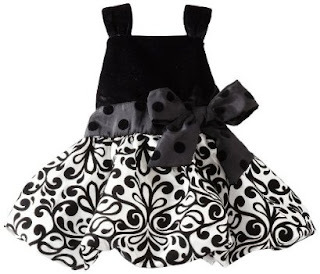 This black and white Mud Pie dress comes in sizes 0-6 months all the way up to 3T. I love the way they used contrasting polkadots on the ribbon sash. I know they call this a "party dress" but I tend to think goth babies would be dressed up more often even for regular daily outings or playgroups with their goth mommies. There's also a set of matching bloomers which also can be used as diaper cover-ups. They even made a cute matching flowery damask bib! 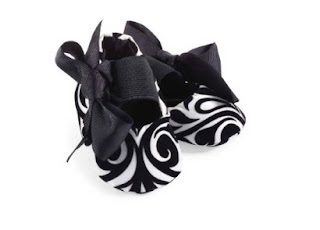 The matching damask booties are a bit Burtonesque! 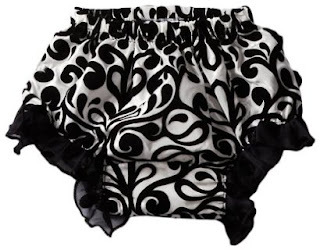 For newborns and smaller infants, there's a pair of matching damask bloomers. 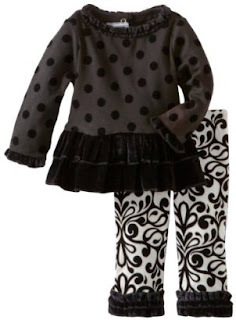 For colder days, this Mud Pie top and leggings set is perfect for little goth toddler girls. It would be an awesome First Day of Preschool outfit! Also comes in sizes 0-6 months through 3T. 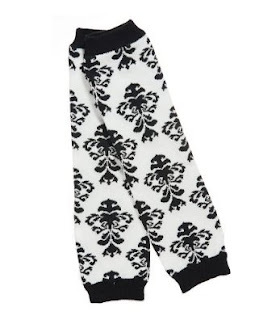 Eldergoths can reminisce back to the 1980s while dressing their babybats in these cute damask legwarmers. 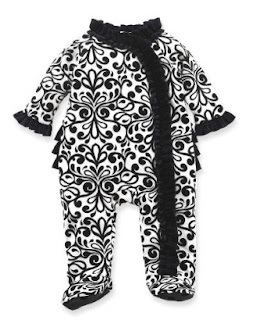 It might seem a little silly to spend this much on a damask sleeper, when probably the only people who will see your baby wearing it is you and your baby's other parent. But often, babies get dressed in their sleepers about an hour before bedtime, brought out to wave goodnight to dinner party guests and perhaps get passed around for some snuggles. So it might be worth it to show off your babybat in this adorable outfit.